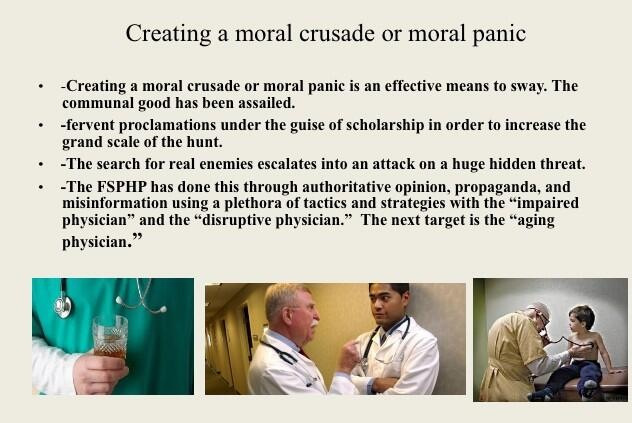 The terms “impaired physician” and the “disruptive physician” are used as labels of deviancy. 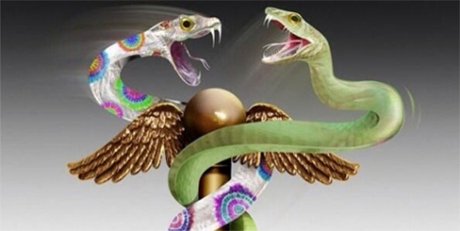 As deviants who allegedly threaten the very core of medicine (patient care) and the business of medicine (profit) they must be stopped at all costs. Belief in the seriousness of the situation justifies intolerance and unfair treatment. The evidentiary standard is lowered. Aided by a “conspiracy of silence” among doctors in which impaired colleagues are not reported necessitates identification of them by any means necessary. Increase the grand scale of the hunt. Sociologist Stanley Cohen used the term “”moral panic” to characterize the amplification of deviance by the media, the public, and agents of social control.1 Labeled as being outside the central core values of consensual society, the deviants in the designated group are perceived as posing a threat to both the values of society and society itself. Belief in the seriousness of the situation justifies intolerance and unfair treatment of the accused. The evidentiary standard is lowered.